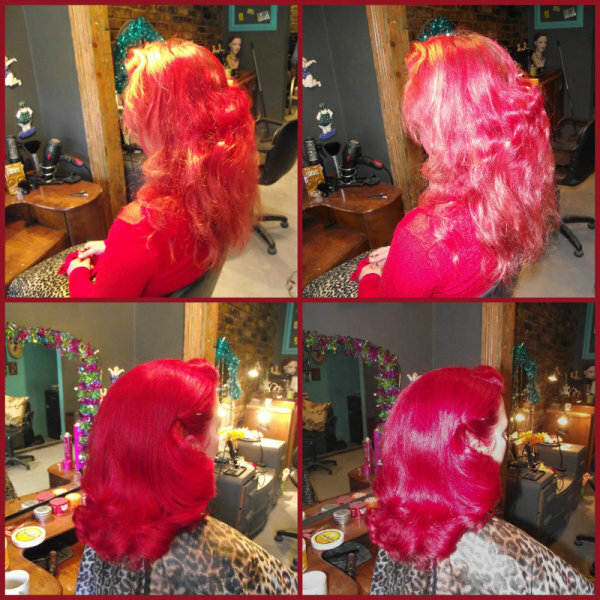 This morning Lucie did this awesome cut and colour (shown with and without flash), which led to a discussion about upkeep of colours. If you want an awesome bright colour like this you do have to accept that it's a pretty high maintainence job. The colours fade fast, and can stain things you own. You can't just book in every 5 weeks and expect the colour to hold up and look fantastic. But yet, we commit to it. Having an awesome hair can definitely be worth it. It's hard to feel glum when your hair is straight out of a comic book! I've been many colours, and had phases of being bothered, and not being bothered with the upkeep, but I definitely feel more of myself with a more unusual coloured hair! When we colour hair like this at the salon we give lots of advice on how best to keep it looking awesome from our own experience (I'm currently turquoise, Lucie is currently yellow and Emma is baby blue!). ReeRee and Guest - sorry Pip Jolley!